$1,350 - New GMPP Fast Burn aluminum heads (same as used on 604 circle track crate engine), 210cc intake ports, 62cc chambers, lightweight 2.0" / 1.55" LT4 valves. 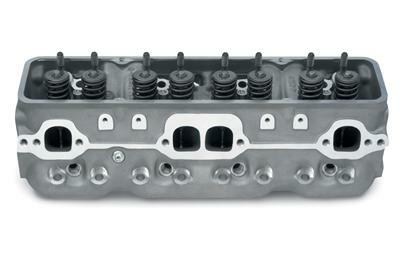 These heads are drilled for both Vortec 8-bolt intakes and earlier style 12-bolt intakes. 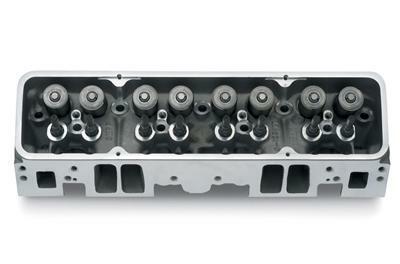 Will accept either newer center bolt valve covers or earlier style valve covers having 1960 and later 4-bolt mounting. Never bolted on an engine. Will ship parts and split shipping cost within lower 48 states...... Payment by US Postal Money Order accepted. GMPP Fastburn heads and Edelbrock Vortec Performer RPM intake are no longer for sale. My son will be using these in his Camaro. Belay my last...... We are going a different route with son's engine. Fastburn heads and matching Performer RPM Vortec intake are again available for sale. These are the same heads used by GMPP on their 604 sealed circle track crate engines and several other of their crate engines. These were originally developed for the limited production, serial numbered ZZ430 engines running the LT4 HOT cam. These heads are new, in original boxes, never bolted on an engine. Intake was removed from crate engine that was never started. New heads, never been on an engine and still in the original boxes, Tom. If you want them as bare castings, I will pull valves and springs. Price bare is $1,050 for the pair, shipped to lower 48 states. If that is acceptable, send me a PM with your E-mail address and we can work out payment and shipping details. I accept U.S. Postal Money Order as payment. Thanks for looking, Tom. Appreciate your interest. Heads and matching intake still available. If someones interested in the casting I'm intersted in the valve train. * I have had these Fastburn heads sitting here new in their original boxes around 18 years now. They are the 1st issue. Castings are same as current design except that GMPP logo laser etched into the front of Fastburn heads has changed 3 times over the years as far as I am aware. * Valves are LT4 lightweight hollow stem. Exhaust valves are sodium filled. As far as I am aware, these are the same valves used in newer Fastburn castings as well. * Valvesprings, retainers and locks are LT4. 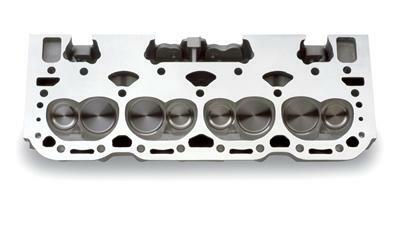 Latest version of Fastburn heads use LS3 crate engine beehive springs and retainers. Either are fine for high performance engines running relatively mild hydraulic roller cams in road cars and for weekend trips to the drag strip. But if you are going to run these heads on a dedicated race car at sustained high speeds such as the GMPP 604 sealed circle track crate engine...... You would want to change out springs, retainers and keepers to gain an additional 500 - 600 RPMs at redline and to ensure GM springs don't fatigue over time and drop a valve during the course of a race season. Randy Brzezinski and others have 'look alike' replacement valve springs, retainers and locks for 604 crate engines if you need them. For more radical hydraulic roller cams, solid roller cams and hydraulic or solid lifter flat tappet cams, you would need to change springs and match them to the cam and application. * If you modify the heads or change out parts (valves and valve gear) in any way, or run them on an engine...... Even Summit and other retailers/wholesalers will not take them back as returns as far as I am aware. * I am a private party. I do not own a business. As a private seller, I cannot warranty these heads beyond the fact that I did purchase them new and they are new GMPP Fastburn heads in their original boxes and have never been bolted on an engine. I cannot take them back as returns nor offer free shipping at the price listed (which is less than Summit and others sell them for). I can pay 1/2 of shipping cost to lower 48 states to help out the buyer there. And I can knock 1/2 of shipping cost off my asking price if you are in the Houston area and pick them up in person. As a private seller, I do not take PayPal nor credit cards nor personal checks. I accept payment by US Postal Money Order if parts are to be shipped. And if parts are picked up in person, payment in cash. That is the best that I can do. If anyone wants them on these terms, contact me via PM or E-mail and we will work out the details. If not...... I am getting old but I probably have 1 or 2 more engine builds left in me and I will run them on one of my own engines. New in box GMPP Fastburn heads (same as used on 604 crate engine) and matching Edelbrock Performer RPM Vortec intake are still available.